You work hard for your cause —doing good work, coordinating volunteers, raising money. Now it’s time to spread the word and share what you do. A well-designed website is one of the best ways for your charity to get attention, promote your work, build trust, and make an even bigger impact. Starting your Jimdo website is simple. Visit www.jimdo.com/templates and select a template to try out. No pressure to choose the perfect one, though — you can change your template at any time without losing your work. You can start with a free version as well! A custom domain name (web address) is one of the best ways to make your nonprofit website look more professional and reputable. JimdoPro and JimdoBusiness customers get a custom domain included in their subscription. When you sign up for Jimdo, you’ll be prompted to register a domain name. If you already have one registered elsewhere, that’s great — you can use that address on your Jimdo site too. You can register any type of domain you like, but it’s best to go with a .org domain for your nonprofit website. This traditionally indicates to visitors that your site is a non-profit or community-based organization (even though there are no official restrictions on who can use a .org domain). It’s possible that your organization’s name might already be taken as a .org domain. If this is the case, try to come up with an alternative that’s easy to remember—and easy to spell! With Jimdo, there’s no one specific “nonprofit” template that you have to use. 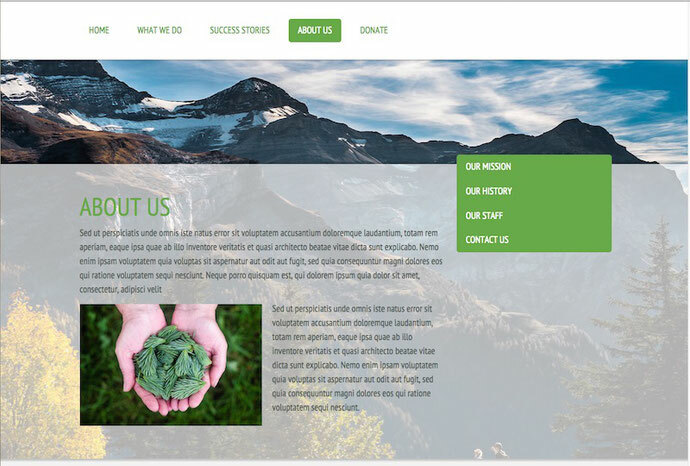 With the right images and text, any Jimdo template can make a fantastic nonprofit website. Your website’s template determines where the logo, navigation menu, content area, and sidebar will appear — and these will be the same on every page. Learn more about how to select the perfect template for your Jimdo website on our blog. Making the best choice will come down to the type of features and content you have, as well as your personal taste. Choosing a template with a sidebar on the left or right side is a good way to keep your contact information, social media icons, and donate button. The content in the sidebar is always visible, which makes it a good place for items that you want to appear on every page. If you have a lot of great photographs and want to showcase those, you might consider a template with a wide content area and room for a large background photograph. You can change your template at any time by logging into your website and clicking Templates in the Site Admin, then selecting one to preview from the alphabetical list. If you like it, click Save, otherwise choose Undo and try a different option. To see all the features of different templates, browse the Jimdo Template Filter. Remember that you can change the color, photographs, and subject matter of the examples very easily. Most visitors expect to find certain information on a nonprofit’s website. You want to make sure you provide relevant information for all the different groups of people that will check out your site: volunteers who want to get involved, potential donors who would like to gather more information about you and (ideally) decide to make a donation, and even press who want to get in touch with you or cover your issue. The home page is your chance to make a first impression. Make sure to have the most important information about your nonprofit in text on this page. Ask yourself the question: If someone didn’t know anything about my organization, what would I tell them? Considering the fact that most visitors will spend fewer than 15 seconds on a web page before navigating away, it’s important to include this snippet or elevator pitch high up on the homepage. Visitors should not have to dig through multiple pages to find out what your nonprofit actually does. Your homepage will vary depending on the kind of organization you run, but a general rule of thumb is to give visitors a brief overview of what the organization is, what it does and where it works, the impact it’s made, and how people can get involved. Then, you can go into more depth and provide more details on your secondary pages. Your homepage could also show your latest news, blog posts, or upcoming events. If you’ve chosen a template with a sidebar, this might be where you put your social media icons, donate button, and newsletter signup (more on these below). Make sure you have a prominent link in your top navigation to “Donate.” If that’s what people want to do, you want to make it easy for them. The Jimdo Button Element is also helpful for creating a call-to-action button that people can click on to get to your donation page. Your homepage is also the place to show off some high-quality photographs. The right image can spark an emotion, draw people in, and, most importantly, make the people or causes you help seem more real. If you don’t have your own photos yet, there are many stock photo websites that have great photos you can use for free. What does this nonprofit do? Where does it do its work? What is its approach, and how does it differ from other organizations that work on similar issues? You can also add video or other multimedia to your About page to bring your story to life, like pictures of your staff or a short interview with your nonprofit’s leaders. Donors want to know that their money is going towards actual results, and not just a lot of talk. Include a page that features stories of impact or outcomes that can be attributed to your organization. You can also consider displaying examples of impact via a photo gallery or interactive, embeddable timeline (such as those from Tiki Toki, Dipity or TimeGlider) to create a more dynamic look and feel. In addition to adding a human face to your organization, success stories will make your organization look more reputable and effective. For some nonprofits, the “Donate” section of their website may be the most important part! Some nonprofits are simply seeking funding. Others can benefit from volunteers, in-kind donations, and the like. No matter what your nonprofit needs, be sure to create a webpage where it’s clear people can get involved in your cause. This page should be easy for people to find and provide clear, specific instructions on what they can do—whether it’s make a donation, get in touch for volunteer opportunities, or spread the word about your cause. Whatever you choose to emphasize, make sure that there’s a clear call-to-action so people who are inspired by your website know what to do next. If you’ve done your job right, ideally people will want to get in touch with you after looking at your website. Make it very clear and easy to contact you—you can do this by creating a separate Contact page, or you can integrate your contact information into existing places (like in your website’s sidebar, which will show up on every page automatically, or on your “Get Involved” page). If you expect different kinds of inquiries, make it clear who people should contact (for example you might have someone on your team who can talk to reporters, and someone else who coordinates volunteers). Jimdo’s Form Element is a great tool to set up an easy, quick contact page. Add a Map Element too to display your location. Testimonials: Just like with a business, testimonials count for a lot. Think about including first-person accounts from people you have helped or donors you have worked with. These can be written testimonials, or short videos of people describing how your organization helped them. Charity ratings, badges and certifications: If you qualify for certain charity rating systems, adding their badges to your site is a good way to show off your stellar reputation. Add the icons of any larger organizations you belong to, or any certifications, charity ratings, or awards your group has received. Your sidebar, footer, or About Page would be a good place to put these. Financials: Many successful charities and nonprofits share information on their finances, showing where their funding goes, who their donors are, and what percentage goes directly to services as opposed to overhead or fundraising. You should also state whether you are a tax-deductible 501(c)3 organization and provide your Federal Tax ID Number. Custom domain: Your own custom website address (www.your-organization.org) shows that your charity or cause is the real deal. JimdoPro and JimdoBusiness customers get a personalized domain included in their subscriptions. A polished and professional design: Donors want to see that you put care and consideration into everything you do, including your website. Proofread your text carefully and keep your design clean and simple. Make sure to use high-quality photographs that aren’t fuzzy. Professional logo: If have the funds, a professional logo may be worth the investment. Your logo will give a cohesive look to all of your branding, social media accounts, and website. Assuming you’d like to use your nonprofit website as a fundraising tool, there are different ways you can solicit donations on your website. The most common solution is to embed a third-party widget into your site that can securely collect payments. Jimdo never charges a transaction fee for the money you collect, though the credit card processor you use will likely charge their own small fee. We recommend the PayPal widget—it’s simple to install on your website and connects directly to your PayPal account. If you want something more specialized, check out options from Razoo, Fundly, and DonorBox. When you use these services, they will provide you with some HTML code, which you will then copy and paste into a Widget/HTML Element on your website where you want the donate box to appear. Jimdo has just released a new Dolphin Store, which is mobile optimized and full of easy to use ecommerce features. This way you can start an online store on your website in minutes, with beautiful product galleries, easy inventory management, secure checkout and international shipping. 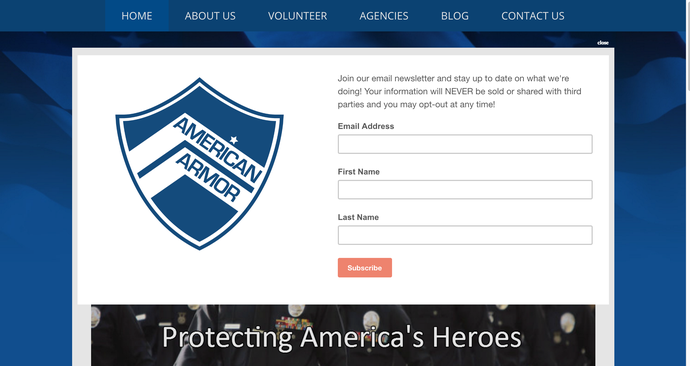 Email marketing is a huge part of operating a nonprofit today, so be sure to collect email addresses on your website. The best option for running an email newsletter for nonprofits is MailChimp. You can start with a free Mailchimp account that will likely be enough for most organizations out there. After you sign up and have started to build your list, it is easy to embed a MailChimp signup form on your website wherever you would like it to appear. Putting it in the sidebar or footer of your website is a good idea as it will then display on each page of your site. If you’re telling compelling stories on your nonprofit website and sharing your successes, people will likely want to follow you. With Jimdo, you can add both follow buttons (which link to your social media accounts) or share buttons (which allow people to share your content on their own account with one click). To find out more about the different buttons and how to install them on your nonprofit website, check out this page of our Support Center. If you and your team can make the time, a blog is a fantastic resource to spread the word about your nonprofit. Blog posts don’t need to be long. A regularly-updated blog is a great place to share your latest news. It’s also a good place to share success stories in addition to the page above. As an added benefit, blogging will improve your website’s search engine ranking by providing lots of regular updates. And it will also provide material to share via social media. Our Support Center has more helpful information on how to start a blog. Now that you’ve got the basics down on your website, it’s time to start doing some search engine optimization so that your nonprofit appears in people’s Google searches. Sometimes search engines can seem mysterious, and there are countless SEO guides and experts out there. But you don’t need to be an SEO wizard to take some basic steps that have worked for countless other websites to date. Spending just a little bit of time under the hood of your nonprofit website will improve your SEO by leaps and bounds. Focus on your cause’s keywords. Think about the terms that people would use to look for a nonprofit like yours on Google. For example they might type in “dog rescue group san francisco” or “volunteer with animals in Hamburg.” Try to think of these terms from the point of view of your potential audience — these are the words and phrases that you’ll want to use in your SEO settings and in the text of your website so that search engines know exactly what your site is about. Once you have an idea of some keywords, you can even do some keyword research to see suggestions for other terms that might be even better to use. Fill out the SEO settings on your Jimdo website. Jimdo comes with built-in features that will give your website’s SEO a boost. First, do a quick check to make sure Google has indexed your website. Then, click on SEO in your website’s Site Admin to open up your SEO Tools. Here you can edit your Site Title, Page Titles, and Page Descriptions to accurately describe your group, using some of the keywords you’ve come up with. Make sure to mention the type of work that you do and the geographic area as well. Both will be important terms that people will use to find you on search engines. For more guidance on how to fill out these settings, check out the SEO section of our Support Center. Go further with more “on-page” SEO tricks. Once you’ve filled out your SEO settings, think about the content that’s on each page of your website. Add Heading Elements to your website and fill in the Alternative Text fields on your images. Also know that the most important factor in search engine ranking is having high-quality, relevant text on your website. Keep your content fresh and high-quality, and be sure to make regular updates to your website so that search engines will keep coming back. Link to your other profiles. You can gain further traction for your nonprofit website by linking to your website from all of your social media profiles. Make sure you have a Google Plus page and a Google My Business listing as these are Google properties and usually show up pretty high in search rankings themselves. The most important thing to know about search engine optimization is that Google is smarter than all of us. You can’t trick it, so don’t waste your time trying. Make sure you have lots of text on your website that mentions your group’s name, your cause and the work that you do, your geographic location, and other noteworthy attributes that potential visitors might search for. Also make sure to update your website regularly. This should be easy to do if you are updating your calendar, blogging, or hosting events, but adding news about these things will keep Google (and your visitors) coming back to your site regularly. Read more about how to get Google to notice your website. Do invest time in finding high quality photographs. 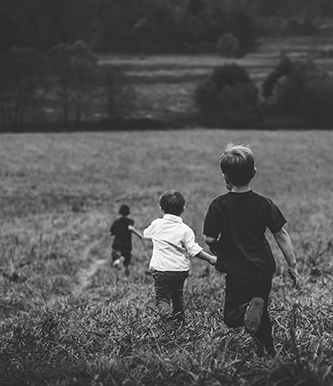 The right photograph can spark an emotional response that will make people want to get involved. Feature your photos in slideshows, in Photo Elements, and as background images. Don’t put too many links in your navigation menu. Navigation menus work best when they are clean, simple, and short. You don’t have to list every page of your website on your homepage. Just focus on the most important ones — this will help focus people’s attention and make sure they can easily find your Donate page. Do share testimonials, success stories, and the icons of any third-party rating systems. This will help potential donors and volunteers know that they are getting involved with a reputable, effective organization. 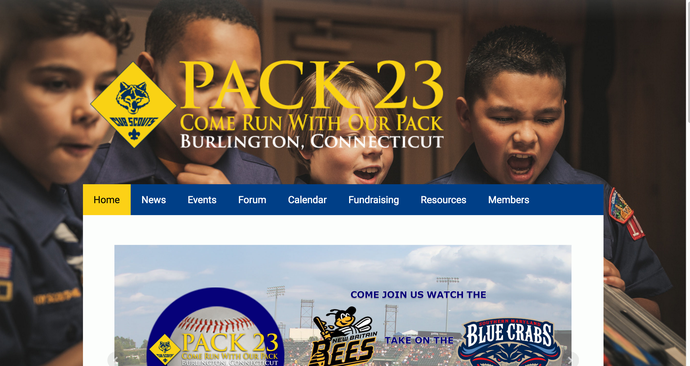 Don’t make the homepage of your nonprofit website into a splash page. A splash page is when you arrive at a site and just see an image and a button and nothing else. This is frustrating for your visitors and will not do you any favors with search engines. Do add lots of text to your homepage in a logical and clean way. Adding some introductory text that describes your nonprofit, the kind of work you do, and how people can get involved is the best way to give your visitors what they are looking for. This checklist can be really helpful to make sure you don’t forget any of the steps that will help you be successful with your website. It always helps to have a little inspiration before getting started. 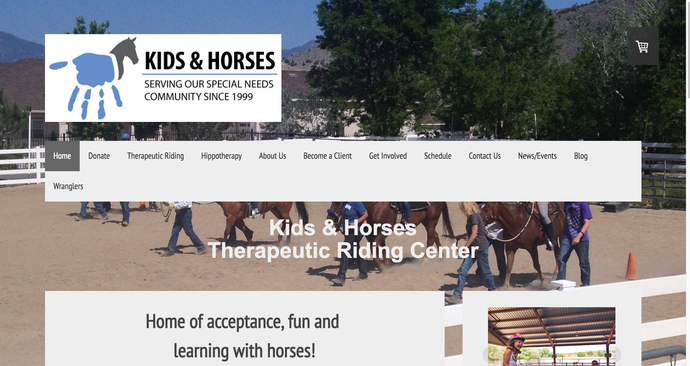 Check out these examples of nonprofit websites that have gotten a great start with Jimdo!